If you live or work in Tokyo, you may occasionally find yourself out late, either drinking or working. And Tokyo isn’t exactly the city that never sleeps, especially when it comes to its extensive train and subway system. So if you don’t want to get stuck sleeping in a capsule hotel, you’ll need to do some planning. That’s where the Tokyo Last Train Map comes in handy. 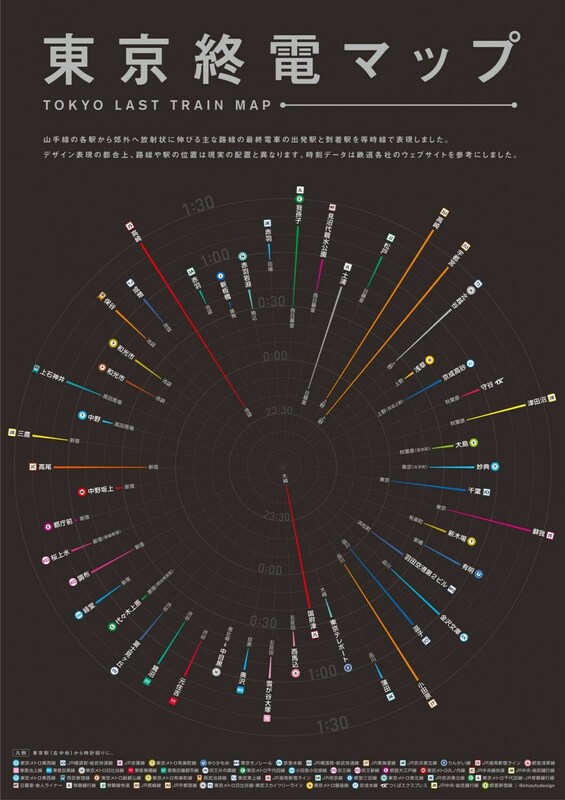 Created by a Japanese designer and map enthusiast who goes by the Twitter handle @chizutodesign, the beautiful print lays out all of Tokyo’s trains in radial form, along with the times they leave their first stop and arrive at their last stop. From far away it almost looks like fireworks. It's a beautiful visualization of Tokyo's massive transit system as it prepares to slowly turn the lights out on another busy day. Read the original article from our friends at Spoon & Tamago via the link below.